I’ve re-recorded my ASP.NET Core Fundamentals course for Pluralsight using the released bits of ASP.NET Core 1.0. I hope you enjoy the videos! In the future I’d like to record videos showing my opinionated approach to using ASP.NET on larger projects. Let Pluralsight know if that’s the type of content you’d like to see! The opinionated approach is really useful from experience person like you. It gives different way to look into the technology. I am really looking forward for such courses. I have submitted request on Pluralsight for videos of your opinionated approach on large projects. I really enjoyed this ASP.NET Course. I, too, have now submitted a request for Pluralsight to allow Scott to make an ASP.NET Core course for the enterprise. Hi Scott. I've always enjoyed your courses and made a request. I added IdentityServer 4 as a suggestion in the request. I'm not sure if that's something that would interest you but I feel like there's very few good tutorials on how to use it with larger scale applications and I think it would be awesome if you were to include the framework in a future course. Cheers! Hi! I really like your asp.net core course from march'2016. Can you say what is different in this new re-recorded course. Or probably what was the reason for re-recording. thanks, and keep the good work! ;) -- s.
Hi Uncle Scott, please you must do the opinionated use of asp.net core for the enterprise...We need it. @SlavoF: The content is mostly the same as the previous course, but with the final 1.0.0 release of ASP.NET Core. I also added a few little things here and there. @Kasper: I love IdentityServer 4. I'll have to check with Dominick as I think he had plans for a course on IS. Allow me to add another vote-up for Identity Server 4. I really think this will be the future of auth in .NET applications (and given how simple it is to set up a basic inbuilt server its use even for even small projects can't be underestimated). Scott, I realise this is Dominick's baby, but having your pedagogy explain it would be of immense help for the .NET community too. 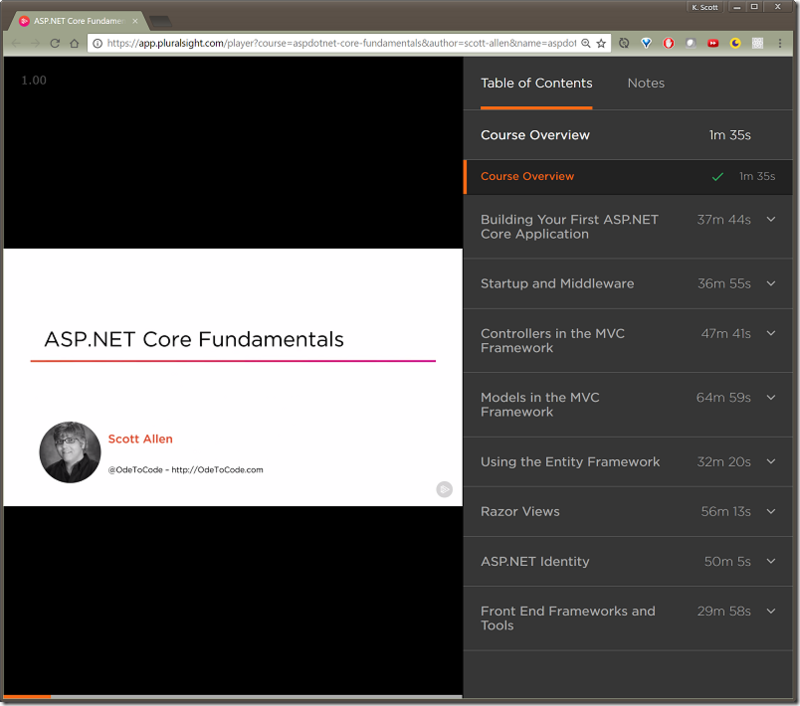 I have put a request to pluralsight too Hope we will receive the course soon! !